DealExtreme offers a wide range of products and services at incredibly low prices in Australia. These DealExtreme promo codes expire soon, so don’t forget to bookmark this page now. Latest DealExtreme promo code: Get up to 55% discount on protective back case with screen protector & water-resistant bag set for your smartphones. DealExtreme free delivery offer: Purchase any electronic gadgets from DealExtreme and get free shipping service on your orders. New DealExtreme discount: Buy touch screen U8 Bluetooth smart watch for your android and IOS devices with up to 24% discount from DealExtreme. Limited time DealExtreme coupon: Order screen protector for your cameras to reduce scratches and dirt on screen, available from just AU$1.58! 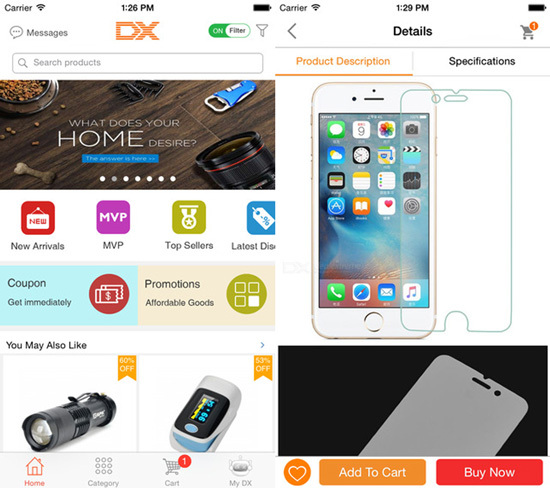 Seasonal DealExtreme deal & sale: Best selling electronic items, gadgets, health & beauty products and more available under $20 at DealExtreme. Exclusive DealExtreme voucher codes: Shop collection of Women's swimwear at DealExtreme for the latest designer, brands & styles, pricing under AU$94.77! DealExtreme is a Chinese online platform, focused on providing consumers exciting gadgets. The website opened in 2005, quickly growing into a global online retailer. It sells low priced gadgets and products across the globe and has often been referred to as the world’s cheapest online store. The company opened its first warehouse in Australia in 2011 and thus guarantees fast deliveries. Aside from the main DealExtreme website, the company group is also affiliated with websites such as Volumerate.com and MadeinChina.com. DealExtreme is a global retailer and therefore, you can order the products all around the world. In addition to shipping globally, the online platform can also be viewed in different languages. Consumer Electronics: Amplifiers, Smart Devices, Portable Audio & Video, Video Games, etc. Car Accessories: Car Audio & Video Systems, Alarms & Security, Diagnostic Tools & Equipment, Car Lights, Care and Auto Parts. Home & Office: Alarm & Protection, Kitchen Supplies, Office Supplies, Electronics, Baby, Pet and Gardening Supplies, Décor and Household Goods. Health & Beauty: Wigs, Health Monitors, Hairdressing, Makeup Supplies & Tools. Electrical & Tools: Chargers, Plugs & Sockets, Gadgets, Cell Phones & Accessories, and Tablets & Accessories. Apparel & Accessories: Eyewear, Jewellery, Men, women & children’s clothing. Hobbies & Toys: R/C Toys, Cosplay & Costumes, Gifts. Finding the right products on the DealExtreme website is easy. You can browse the items according to the product categories or use the search function to find the items. Furthermore, when you are viewing the products, you can narrow your search based on the price and the user-generated reviews. This can guarantee you find the highest rated products or the items that best suit your budget. If you want a bit of inspiration to your shopping, the DX Blog is worth checking out. The blog has information regarding the hottest deals and seasonal promotions. But aside from finding great discounts and deals, the blog is also great for learning more about the products. You can read about reviews and learn more about the platform and its operations as well. DealExtreme offers even more ways to save money with your shopping with the help of coupon codes. You simply need to conduct your shopping and head down to the checkout once you are done. On the first page of the checkout process, you’ll be able to enter the coupon code at the bottom of the screen. There you’ll find a section asking ‘Have a Coupon Code?’ Click the link and you’ll be able to enter your code and apply the savings to your order. Looking out for an unparalleled collection of high-quality consumer products from all the categories? Take a look at one of the global online retailer Light In The Box, a best place to find everything you need under one single roof. The shipping options on the online platform are varied. You can enjoy the Standard Delivery for free on all orders above $15. The service is tracked and so you can keep an eye on your order at all times. If your order is below $15, your products are shipped with a non-tracked airmail service. Finally, you’ll have an Expedited Delivery option available, which takes around 7 to 15 business days to deliver and process. Certain products come with a warranty, which means you are entitled to return the items for a full refund. In order to start the return and refund period, you need to contact the customer service through a contact form available on the website. DealExtreme’s gadgets are also available right in your mobile phone. The DX App will allow you to view the products, shop your favourites and follow your order in an instant. You can find the offers and the newest products without a hassle and the app is available for free. You can download it from the App Store for iOS phones and from Google Play to Android phones. You can earn DX points every time you shop on the online platform. The points are issued at 10% of the order total and they can take around 90 days to activate. You’ll also be able to gain more points by posting on the forums and reviewing the orders. Once you’ve collected enough points, you can use them to pay part of a product or the entire order if you’ve saved enough points! DealExtreme has an active community, which is a great way to find out about the hottest gadgets and other deals on the site. You can even get help for using the products and making the most of your shopping through the community section. You can view forum posts and check out user reviews of the newest items. You have plenty of ways to stay in touch with the retailer in case you encounter any problems. The Customer Service Express section has a number of valuable sections ranging from FAQ to Order Tracking. If you can’t find your answer on the online portal, you can contact the retailer either by calling their English service or chatting with a customer service representative online. Never miss an offer or an exclusive deal by following DealExtreme on social media. You can find the social media profiles full of ideas and exclusive offers and have fun by getting to know other satisfied customers.